It’s Christmas Day and time for our annual tradition of Jews eat Asian food on Christian holidays (why? you ask…because we get the day off and nothing else is usually open, though that’s changed in recent years). Normally we go down to Todai, a chain of buffets with huge amounts of decent sushi and other Japanese and Chinese food. But the closest one is an hour away and recently changed ownership (less sushi & seafood, more meat, more money). So this year we decided to go to Gourmet Garden, a non-chain Japanese/Chinese/American buffet with a smaller selection at half the price. The real plus? it’s 3 miles from our house. We went once before and I came away disappointed, so was reluctant to go again. On this trip, I realized I had misremembered. The food is actually pretty good. Everything is made fresh and tastes like something you’d get in a home kitchen. The disappointment was simply that most of the food has meat or egg or both and that doesn’t leave much I can eat. 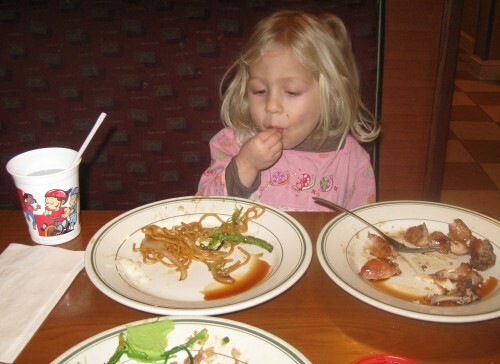 There are several safe dishes to be sure, but not the full variety you expect from a buffet. Let’s start with the sushi. At Gourmet Garden, the sushi station is the heart and soul of the place. A young smiling man (his picture doesn’t do him justice) named Raymond creates both standard and masterful sushi and sashimi dishes with the few ingredients he has in front of him. Unfortunately, each and every one of the sushi pieces has wasabi mayonnaise, which means Miriam poison (eggs). 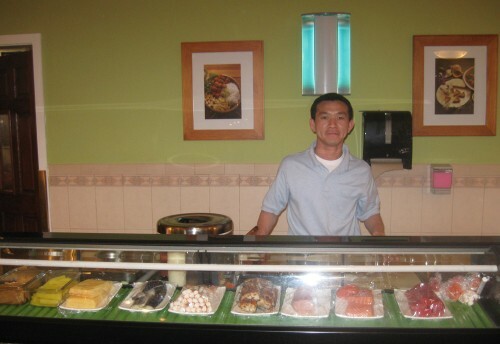 Raymond though is more than happy to make sushi to order. He offered Miriam a vegetable maki roll but she said nope, she wanted one with raw fish, and chose the salmon. He also made me a maki roll with eel and pickled turnip and some salmon nigiri (there’s a sushi FAQ with pictures so you can sound as educated as I do). Sushi is my favorite part of these buffets and it’s hard not to just be able to choose what I want and put it on my plate (some of the creations were just gorgeous too). So I limited myself to 3 special orders (16 small pieces, which Miriam ate several of) and enjoyed the rest of the food offerings. My usual way of working a buffet is to grab an employee (not a server, as they rarely know anything about the food) and get a rundown of what is and isn’t safe for me to eat. Unfortunately, not a single one of the buffet workers I asked spoke English. Several of them spoke Spanish (which I also speak) but were only guessing about the food ingredients. Raymond to the rescue again. He knew how every dish was made. He was so knowledgeable, in fact, that I asked if he owned the restaurant. No, he’s just the sushi chef, but he goes through the kitchen to see how all the food is made and then retains it all somehow. After I got permission to take his picture for my review, he asked me to tell my readers that he’s looking to find a young American girlfriend. A sweet man who knows how to cook, not a bad catch. I ended up with several plates of good food. Above we have (from top and clockwise): salt & pepper shrimp (very good but messy), green beans (moderately spiced), seaweed salad (one of my favorites), family style tofu (I had a craving for braised cabbage as we drove to the restaurant and this dish satisfied it, the tofu was cooked perfectly too), eel maki, and shrimp with vegetables. On the plate below we have: steamed cod (the only miss of the night…it was cooked adequately but was too bland, it would have be good with a spicy sauce or mixed into another dish), broiled oysters (delicious if you get them fresh and choose the bigger juicier ones), and more family style tofu. Miriam asked for, surprise surprise, chicken and I found two she could eat: teriyaki and 5 spice. 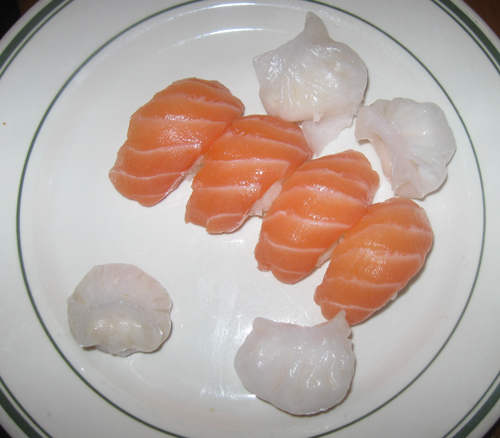 She also had noodles, sushi, fruit, and several pieces of marinated sashimi, before deciding it was too spicy. I didn’t ask about dairy but I suspect most of the dishes were dairy-free. There was cheese in the salad bar and butter in some of the American dishes. I didn’t bother to ask about gluten either. Though, except for the noodles and dumplings, I would guess that the only gluten we ate was soy sauce (which was in almost every hot dish). A few choices were breaded but they all had egg in them so we didn’t eat them anyway. Because it’s a buffet and you can ignore rice and other starches, you can eat here lowcarb. Sashimi, seaweed, vegetables, tofu, a salad bar, meat, and soups. Some of the sauces might be a bit on the carby side for those who need to keep their carb counts way down. 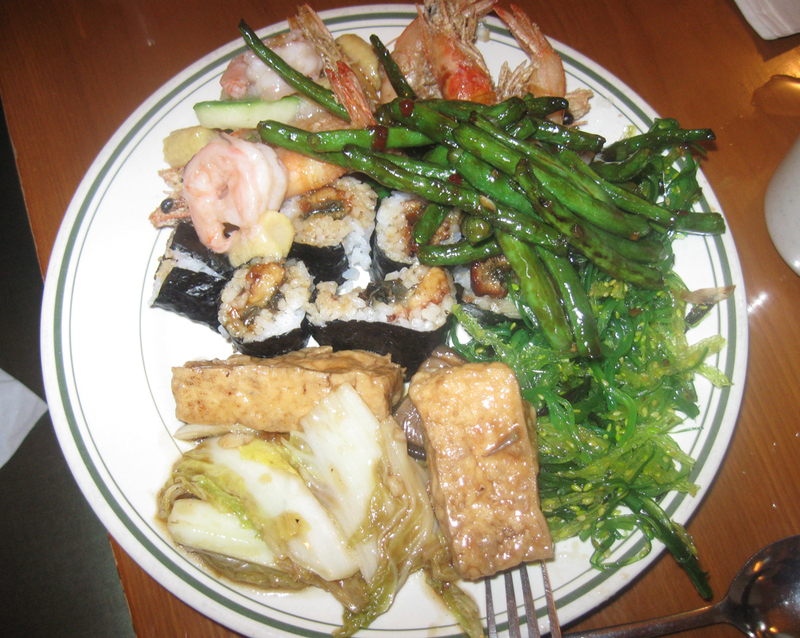 Vegetarians have good choices too with a lot of the lowcarb items plus rice, noodles, vegetable sushi, and bread. All of the desserts appeared to have dairy and eggs and wheat. 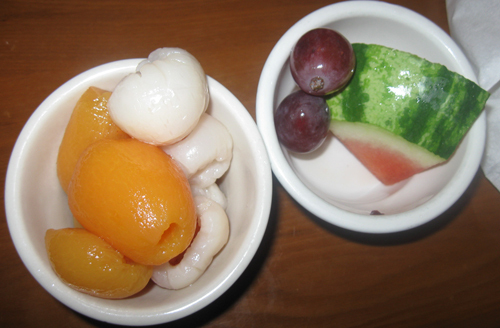 They had some (out of season) fresh fruit and several canned fruits including lychees. The restaurant is all on one level with easy wheelchair access to tables an the buffet area. The buffet stations themselves are a bit hard to reach from a sitting position, but no worse than any salad bar. Nothing was burning inside and there was no noticeable propane or other smells, aside from the yummy food. We did not check out the bathrooms. With some careful navigation, Gourmet Garden can accommodate a variety of dietary restrictions. 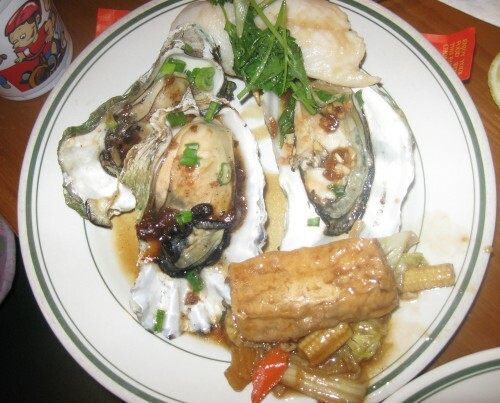 For those with none, you’ll find a decent variety of hot and cold dishes, all fresh and inviting. I chuckled at the “American girlfriend” part and am going to the Gourmet Garden for my 14th birthday tomorrow.